I can hardly believe I have been partying every year for the past 4 years with the girls over at 5 Minutes For Mom. Over the years I have met so many bloggers and made so many lasting friendships. Last year I found myself rambling so this year I hope to keep things a little more simple. Hello, my name is Kristin. I have been blogging for 7 years. I have two daughters Kaila and Brooklin. Kaila is soft and sweet, she’s petite and kind hearted. She’s really smart and even more so creative. My Brooklin is just like me, she’s chaotic and hyper. She’s full of laughs and will always make you smile. She’s the annoying little sister but she loves the attention. We are also expecting baby #3 in June who will be named Mia. I am not perfect but have learned to accept myself. I am constantly evolving and know the person that I want to be and am willing to change myself and evolve for that to happen. This blog is my little piece of the world. I never want my children to feel the way I did as a child so I write about them, a lot. This site has and always will be my journal for my children. This blog is also a way for me to share some of my favorite products, as a perk I also get to do some pretty remarkable giveaways. I also have a passion for wholesome foods, and often share my love of food and photography here. If you’d like to I have a Facebook fan page, and find me on Twitter also find me on YouTube. If you’d like to trade banners let me know in a comment, I’ll come and snag yours! love all your recipes!!! it’s pretty awesome how long wehave bene blogging. I just love your spot. What a fun looking family. Great smiles and lovely party post. Nice to “meet” you. Good Afternoon Kristin! Stopping by from the UBP12 to say hello. Your family is beautiful and congrats on the new bundle of joy about to join your family. Have fun this week with the party!!! Love your girls names! Beautiful. hello from UBP — have a blessed weekend! Good luck with your new baby! I think I’ve visited your blog before. Just stopping by from the UBP12! have a wonderful weekend. I just found UBP late last night and I wish I too had found it years ago! Congrats on being a blogger so long! You have beautiful photos. I look forward to keeping in touch! Not sure if your interested but I have blogger sign ups going on for Kindle giveaway, check it out if you have a moment! Wow, it has been that long, hasn’t it?! Amazing. Always glad to see your smile! You guys look like such a sweet, loving, happy family. You sound like an awesome mommy to your adorable lil girls. 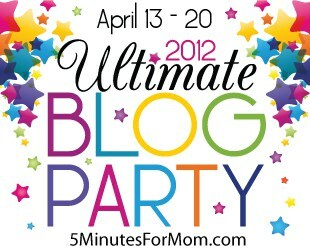 I love reading your blog to see such an awesome family, great recipes, photos, information, and great giveaways. Keep up all the wonderful work. Here from the UBP12 party! Congratulations on your soon to be newest family member. I love your site.